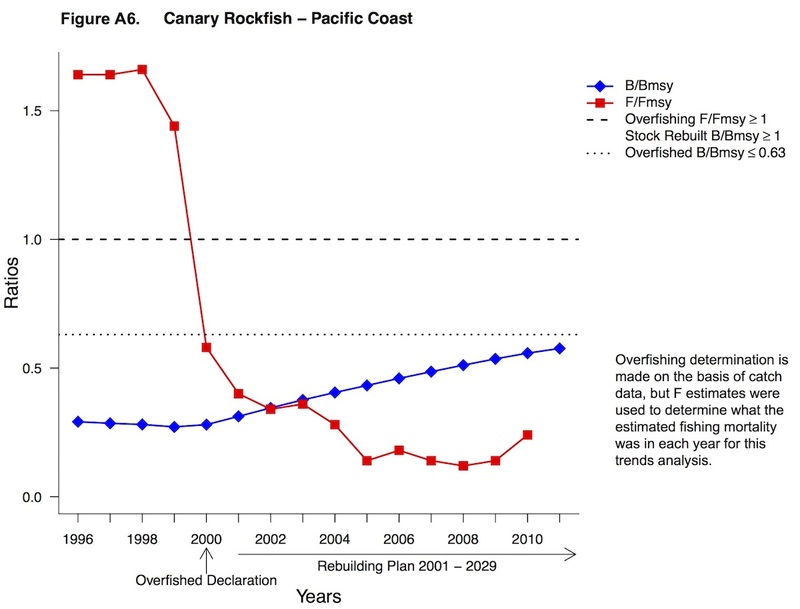 Example of a figure I developed and automated as part of the Trends Analysis for Fish Stocks in Rebuilding Plans report. While working as a contractor and Knauss Marine Policy Fellow with NOAA Fisheries, I developed text, tables, and figures for two national, annual reports: Fisheries Economics of the United States, which summarizes the economic performance of the fishing industry for stakeholders, and Trends Analysis for Fish Stocks in Rebuilding Plans, which summarizes and illustrates the rebuilding progress of overfished stocks. This work involved compiling, checking, summarizing, and visualizing large data sets. I developed scripts in R and R Markdown to automate this process and these scripts can be used to easily generate these products for future reports. I developed a bio-economic model of marine recreational fisheries off Washington and Oregon while working as a contractor at the NOAA Fisheries Northwest Fisheries Science Center. Recreational fisheries make up a substantial portion of catch for many West Coast fish stocks and are economically, socially, and culturally important. It is difficult to predict how changes in recreational fisheries regulations (e.g. bag limits, size limits, seasonal closures) will influence recreational angler effort and recreational fishing mortality for both targeted and bycatch stocks. To better understand this and promote informed management decisions, my colleagues and I built a bio-economic simulation model of marine groundfish and salmon recreational fisheries off Washington and Oregon. I collaborated with stakeholders from the fishing industry, state agencies, and NOAA to ensure the model would be relevant to management decisions. I compiled data from many different sources and summarized and analyzed the data for inclusion in the simulation model, including zero-inflated negative binomial modeling of catch-per-trip and probability distribution analysis of catch-by-length. While working on this project, I also contributed to an assessment of the black rockfish stocks off Washington, Oregon, and California and helped present the assessment model to reviewers and stakeholders at a stock assessment review meeting. Stachura, M. M. (presenter), L. E. Anderson, and O. S. Hamel. 2015. 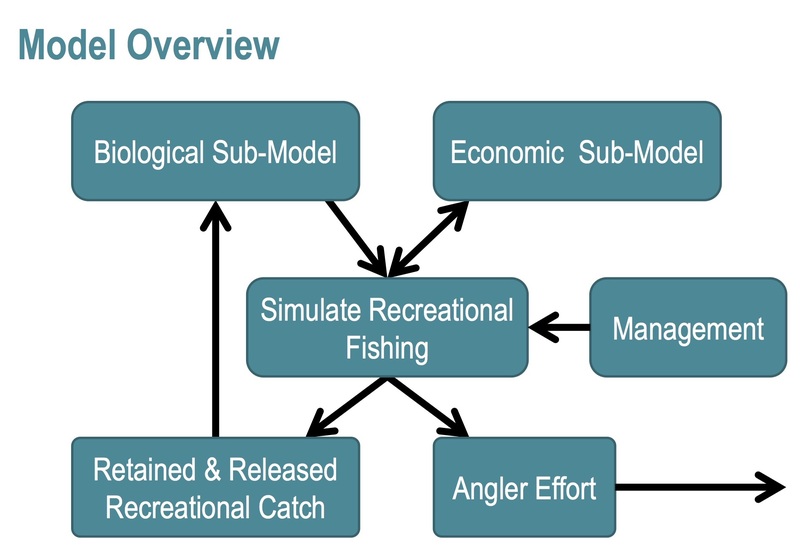 A Bio-economic Model of Marine Recreational Fisheries off Washington and Oregon. University of Washington, School of Aquatic and Fishery Sciences, Quantitative Seminar. An example of a visualization I developed to summarize the results of the climate vulnerability assessment by species. While working as a Knauss Marine Policy Fellow in the NOAA Fisheries Office of Sustainable Fisheries, I contributed to an assessment of the vulnerability to climate change of 82 marine fish and shellfish species living in the Northeast U.S. Continental Shelf. I developed R scripts to analyze and visualize the results of the vulnerability assessment, which have been used in applications of this methodology in other regions of the U.S. to assess the vulnerability of marine species to climate change. I also helped faciliate a workshop of experts contributing to the assessment and determine how to best implement and analyze the results of this assessment. 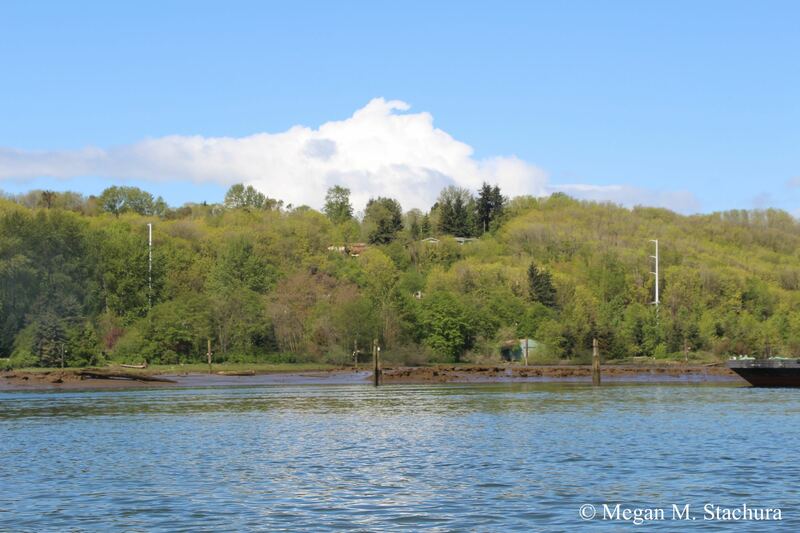 View of Terminal 107 Park from the Duwamish River. I am a Puget Sound Steward at the Terminal 107 Park along the Duwamish River in Seattle. I help to restore and maintain the habitat at this site by engaging, educating, and leading community volunteers and through regular weeding, watering, planting, and monitoring. 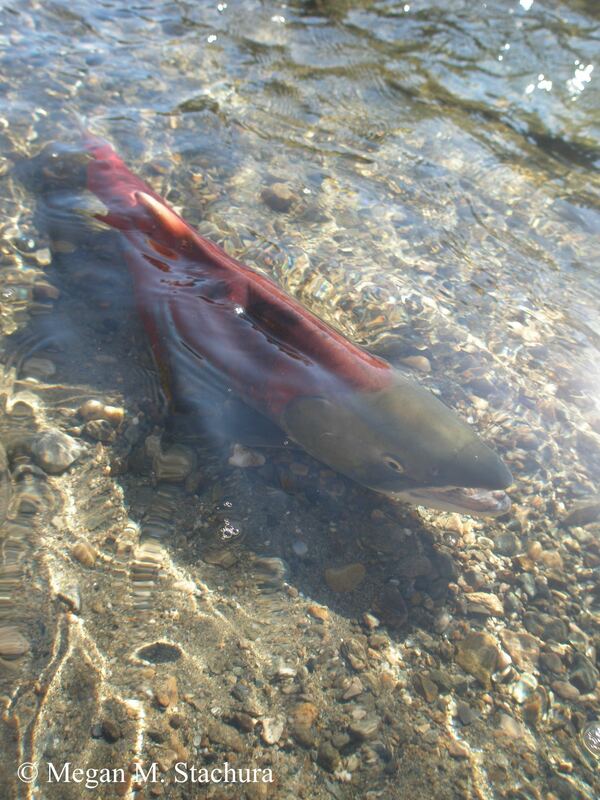 There have been dramatic declines in the number of adult Chinook salmon (Oncorhynchus tshawytscha) returning to the Arctic-Yukon-Kuskokwim region of western Alaska in recent decades. To better understand the causes of these poor returns, I studied how freshwater and ocean environmental conditions impact their survival. I compiled relevant environmental data (e.g. river flow, air temperature, sea surface temperature) from many sources and developed models (e.g., linear mixed models) to identify processes and variables important to Chinook salmon survival in this region. 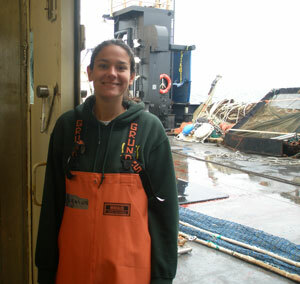 Megan aboard the NOAA ship Oscar Dyson in the Gulf of Alaska in August 2011 for the walleye pollock acoustic-trawl survey. 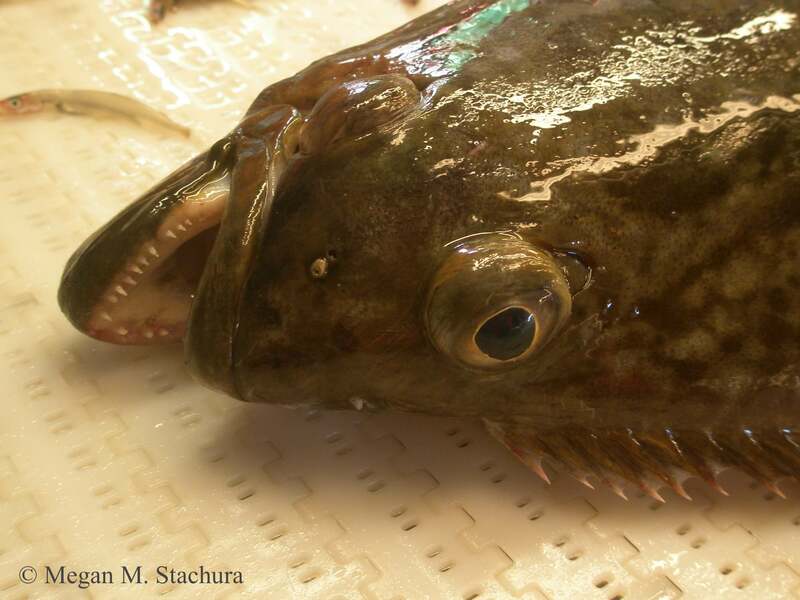 Arrowtooth flounder, a groundfish found in the Northeast Pacific. Understanding environmental influences on marine fish productivity is important for sustainable, ecosystem-based management of marine resources. This knowledge is particularly important for early life stages when fish are most sensitive to changes in the environment. I investigated the hypothesis that groups of Northeast Pacific marine fish stocks exhibit synchronous recruitment (the number of fish spawned in a certain year as they reach an age that they are susceptible to fishing) due to a shared susceptibility to environmental influences. I investigated the effects of regional environmental variables such as water temperature, freshwater runoff, and upwelling. I used Bayesian hierarchical models to model recruitment for groups of stocks with similar early life histories as a function of these environmental covariates. This research was part of my Master's thesis at the University of Washington School of Aquatic and Fishery Sciences. I shared the results of this work through a paper and presentations at several scientific and fishery management meetings. I also contributed to several related projects, inculding an analysis and summary of the ecosystem effects of the Atlantic Multidecadal Oscillation and a study of the reproductive resilience of marine fish stocks and ways to account for this in assessment and management. 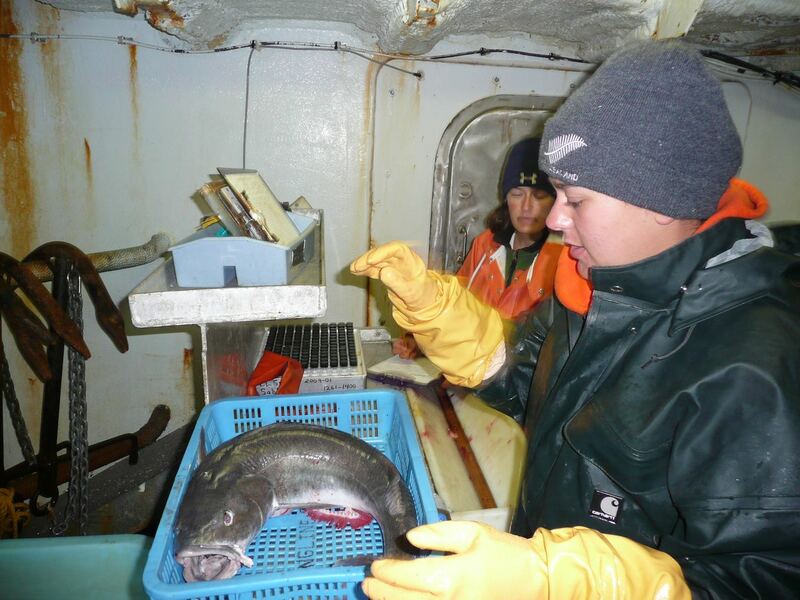 To learn more about Northeast Pacific fish species I participated in many field surveys, including an acoustic-trawl survey of walleye pollock in the Gulf of Alaska during the summer of 2011. Stachura, M. M. (presenter), T. E. Essington, N. J. Mantua, T. A. Branch, A. B. Hollowed, P. D. Spencer, and M. A. Haltuch. 2013. Is recruitment synchrony due to shared susceptibility to environmental variables? Alaska Marine Science Symposium. Lowerre-Barbieri, S., G. DeCelles, P. Pepin, I. A. Catalan, B. Muhling, B. Erisman, S. X. Cadrin, J. Alós, A. Ospina-Alvarez, M. M. Stachura, M. D. Tringali, S. W. Burnsed, and C. B. Paris. In Press. Reproductive resilience: a paradigm shift in understanding spawner-recruit systems in exploited marine fish. Fish and Fisheries. I utilized multivarate statistics (e.g., principal component analysis) to identify common patterns of variation in the abundance of wild pink salmon (Oncorhynchus gorbuscha), chum salmon (O. keta), and sockeye salmon (O. nerka) from 34 population groups from Asia and western North America using multivariate analysis techniques. I also identified oceanographic and atmospheric variables that covary with the major patterns of salmon abundance variations. This research was part of my Master's thesis at the University of Washington School of Aquatic and Fishery Sciences and the results were shared through a paper. Beaugrand, G., A. Conversi, S. Chiba, M. Edwards, S. Fonda-Umani, C. Greene, N. J. Mantua, S. A. Otto, P. C. Reid, M. M. Stachura, L. Stemmann, and H. Sugisaki. 2015. Synchronous marine pelagic regime shifts in the Northern Hemisphere. Philosophical Transactions of the Royal Society B: Biological Sciences. 370(1659). doi: 10.1098/rstb. 2013.0272. 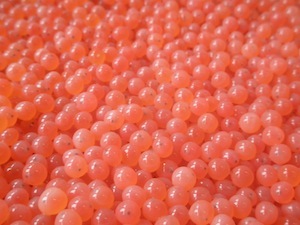 We saw salmon eggs on an Inspiring Connections Outdoors trip to the Issaquah Salmon Hatchery. I volunteered for six years with the Sierra Club's Inspiring Connections Outdoors (ICO) program, a community outreach program providing opportunities to explore, enjoy and protect the natural world for those who would not otherwise have them. I planned and led outdoor trips (e.g. hiking, horseback riding, visit to a salmon hatchery) for middle school students and recruited and led other volunteers. 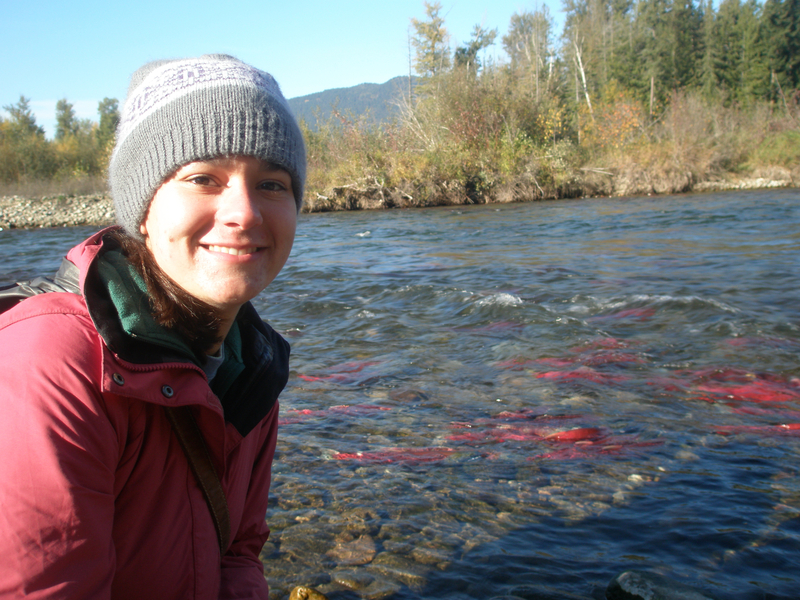 For example, we visited a local salmon hatchery and I facilitated games to help the students learn about salmon. 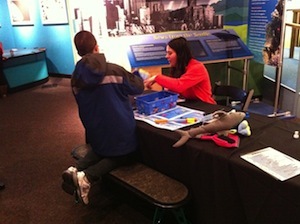 I volunteered with chapters of this organizion in both Seattle, Washington and Washington, D.C.
Megan teaching a musem visitor about fishery science at Polar Science Weekend. 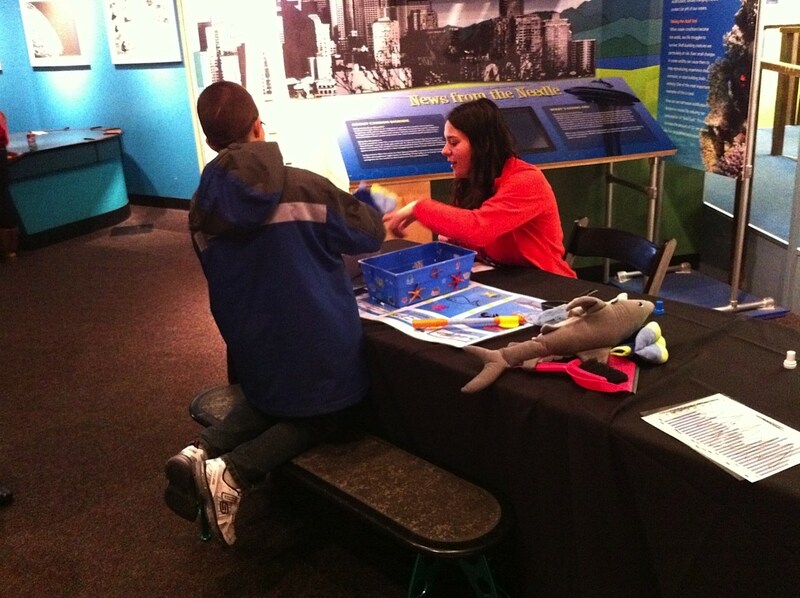 As a Science Communcation Fellow at the Pacific Science Center, I developed hands-on activities to teach the public about fishery science and management. I presented these activities at Meet A Scientist events and special events like Polar Science Weekend. I have continued presenting these activities at the Smithsonian National Museum of Natural History and other community events. 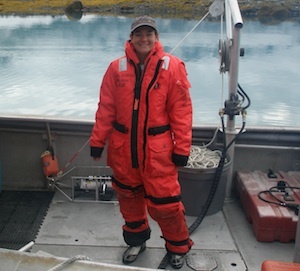 Megan collecting oceanographic data in Glacier Bay National Park and Preserve in July 2010. 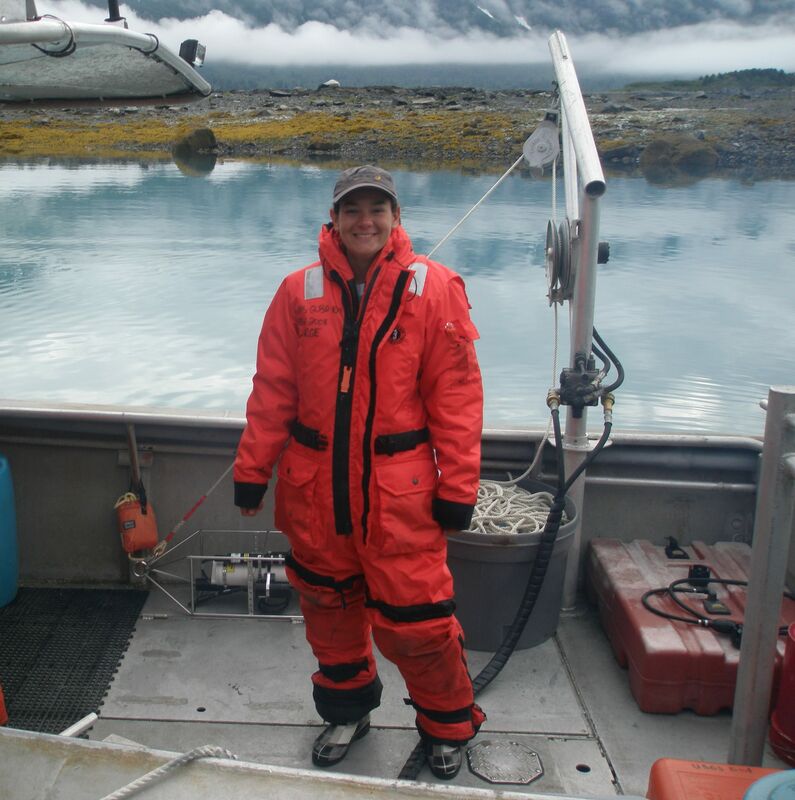 I worked with the National Park Service Southeast Alaska Inventory and Monitoring Network to make 16 years of historical oceanographic data from Glacier Bay National Park and Preserve widely available to scientists and the general public through an online database. These data are now used in ecosystem monitoring and scientific research. I also participated in field work to collect oceanographic data in the park. Johnson, W. F. and M. M. Stachura. 2011. 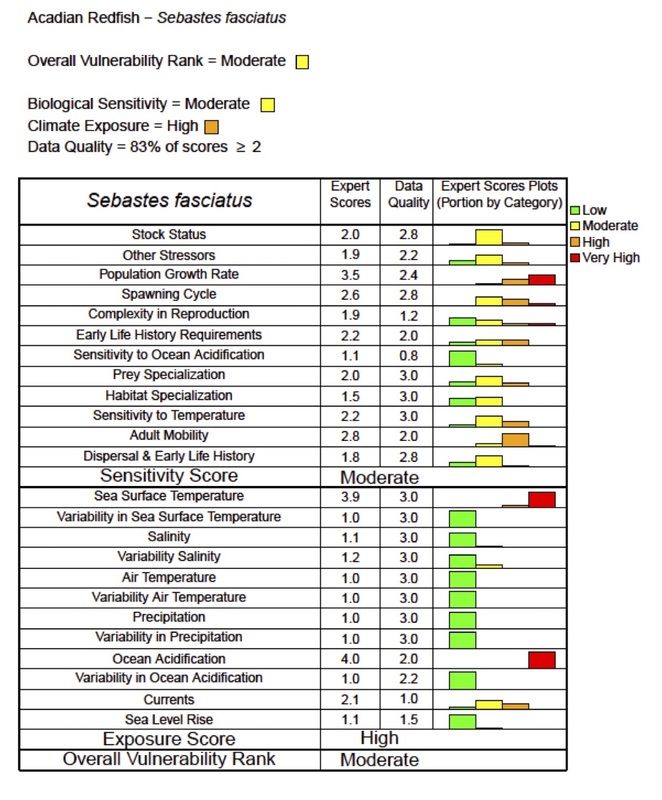 Creation of Glacier Bay oceanographic information products defined in protocol OC-2010.1 using legacy data covering 1993 through 2008: methods, quality levels, and exceptions. Natural Resource Data Series NPS/SEAN/NRDS—2011/130. National Park Service, Fort Collins, Colorado. Megan weighing a sablefish aboard the F/V Ocean Prowler in the Gulf of Alaska for the 2009 sablefish longline survey. The aim of this project was to determine the bycatch discard mortality rate of Alaska sablefish (Anoplopoma fimbria) and factors affecting mortality for use in stock assessments to better inform management decisions. I compiled information for over 10,000 tagged sablefish and conducted a statistical analysis of relative recapture rates based on several factors using a logistic regression. 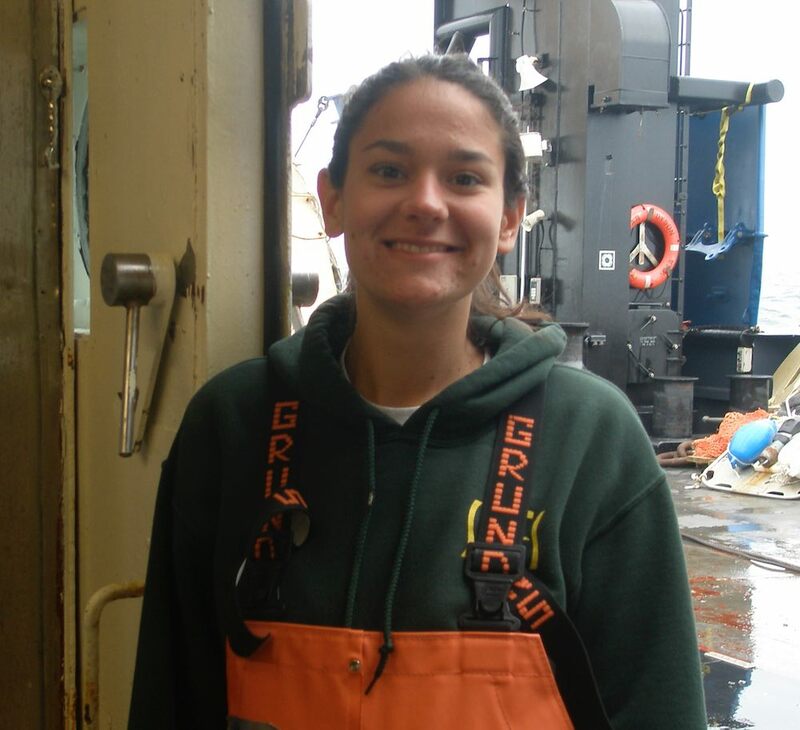 I also participated in the sablefish longline survey and collected data at-sea on the occurrence of prior hooking injuries in the Alaska sablefish population. I began this project during an internship through the National Oceanic and Atmospheric Administration (NOAA) Hollings Scholarship Program. I continued this research as a Senior Thesis at the University of Miami Rosenstiel School of Marine and Atmospheric Science and published the findings. Stachura, M. M. (presenter), C. R. Lunsford, C. J. Rodgveller, and J. Heifetz. 2012. Estimation of discard mortality of sablefish (Anoplopoma fimbria) in Alaska longline fisheries. Fishery Bulletin, 110: 271-279. Stachura, M. M., C. R. Lunsford, C. J. Rodgveller, and J. Heifetz. 2010. Mortality of incidentally caught and released sablefish (Anoplopoma fimbria) on longline gear in Alaska. Western Groundfish Conference. Best student poster award recipient. 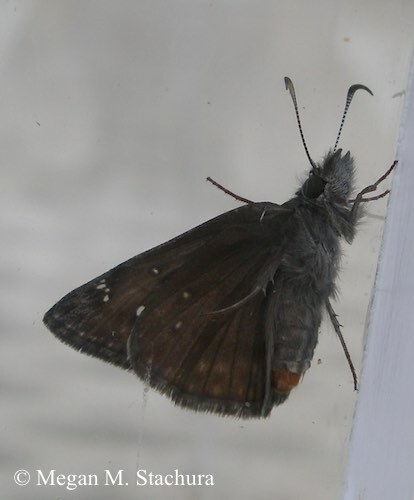 To better understand how insects may respond to climate change, I designed and implemented a research project investigating the effects of temperature on the flight ability of the Propertius duskywing butterfly (Erynnis propertius). I completed this research with Dr. Jessica Hellmann at the University of Notre Dame through the U.S. Department of Energy Global Change Education Program Summer Undergraduate Research Experience. Stachura, M. M. (presenter) and J. J. Hellmann. 2008. The dependence of butterfly flight on temperature. U.S. Department of Energy Global Change Education Program End-of-Summer Workshop.